Today I would like to share you the sowing seeds techniques great for growing "ADENIUM OBESUM" and "ADENIUM THAISOCOTRANUM". The media for growing this adenium specie is unlike growing "ADENIUM ARABICUM". 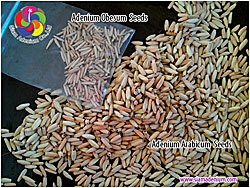 Adenium Obesum seeds are small and pretty weak so the suitable media should be very tiny like powder which can help their roots growing easier. 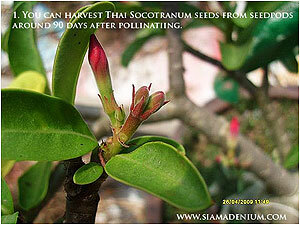 This method could work greatly on "Rosy Adenium" as well so it would be very easy to create our new adenium flowers. The perfect media I use is flitering "COCONUT POWDER". Coconut powder is neutral, not too acid or base and also can keep the moisture longer and no water draining. 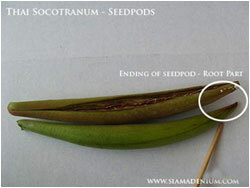 Here below are the steps of sowing seeds methods. 3. Watering coconut powder with fungicide chemical until it's soaked. Fungicide chemical is very important which can protect baby seedlings not to get rotten especially occur with their roots. 4. Put the coconut fibre on the bottom of our sowing basket. This is to help water not flow out too fast and also protect coconut powder flow out from bottom of basket. 5. Please make sure the amount of baskets are matched with amount of seeds. 6. Cover the coconut fibre with coconut powder. 7. 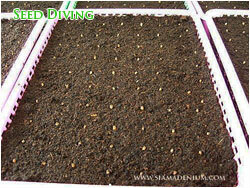 This is the "Organic Granular Fish Fertilizer", this fertilizer is very good for baby and younger seedlings. This fertilizer will help them growing stronger and healthier by nature themselves unlike chemical fertilizer just boost up the growing rate but weak themselves in future growing. 8. Spread the fish fertilizer all over coconut powder (2nd layer). 10. Cover it again with coconut powder. 11. Watering them again until you see water come down from bottom of basket. 12. Use the ruler to make the rows. 13. 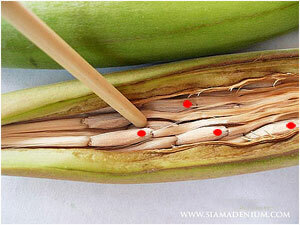 Use the clipper to put each seed in each row very gently. 14. Put the tag name and date of sowing. This will help you to easily remember espcially with new hybrid crossing. 15. Cover it again with dry coconut powder, should be about 1 cm height. 16. Watering them again until top coconut powder just getting wet. 17. Use the basket cover to cover baskets and put them in the shade for a week. 18. 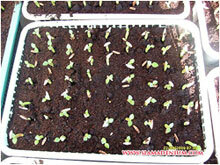 After a week, open the basket cover then you will see new baby seedlings growing up from media in 7th or 10th day. 19. Spread the fish fertilizer again all over seedlings. That's all and hope you will have fun with this. 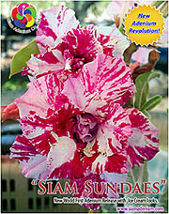 This is sample of new world adenium variety coming from sowing seeds. 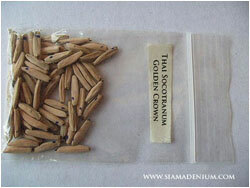 Let's see why you will have fun with this adenium sowing.